Willa Knox has always prided herself on being the embodiment of responsibility for her family. Which is why it’s so unnerving that she’s arrived at middle age with nothing to show for her hard work and dedication but a stack of unpaid bills and an inherited brick home in Vineland, New Jersey, that is literally falling apart. The magazine where she worked has folded, and the college where her husband had tenure has closed. The dilapidated house is also home to her ailing and cantankerous Greek father-in-law and her two grown children: her stubborn, free-spirited daughter, Tig, and her dutiful debt-ridden, ivy educated son, Zeke, who has arrived with his unplanned baby in the wake of a life-shattering development. In an act of desperation, Willa begins to investigate the history of her home, hoping that the local historical preservation society might take an interest and provide funding for its direly needed repairs. Through her research into Vineland’s past and its creation as a Utopian community, she discovers a kindred spirit from the 1880s, Thatcher Greenwood. A science teacher with a lifelong passion for honest investigation, Thatcher finds himself under siege in his community for telling the truth: his employer forbids him to speak of the exciting new theory recently published by Charles Darwin. Thatcher’s friendships with a brilliant woman scientist and a renegade newspaper editor draw him into a vendetta with the town’s most powerful men. At home, his new wife and status-conscious mother-in-law bristle at the risk of scandal, and dismiss his financial worries and the news that their elegant house is structurally unsound. Brilliantly executed and compulsively readable, Unsheltered is the story of two families, in two centuries, who live at the corner of Sixth and Plum, as they navigate the challenges of surviving a world in the throes of major cultural shifts. In this mesmerizing story told in alternating chapters, Willa and Thatcher come to realize that though the future is uncertain, even unnerving, shelter can be found in the bonds of kindred—whether family or friends—and in the strength of the human spirit. Unsheltered is definitely one of those “you’ll love it or you’ll hate it” kind of books; it’s polarizing to the extreme. As of this writing, the two top rated Goodreads reviews of this book are a five star review… and a one star review. Personally, I found myself enjoying it, but I do understand why it doesn’t work for a lot of people. The pacing is somewhat slow, making it feel overly long at times. It’s very wrapped up in political musings and borders on being preachy, to say the least. If you go to fiction for escapism, this book will be torture for you. That being said, I found myself drawn into both timelines of the story. It took me longer to get invested in the historical timeline than the modern timeline, but it eventually became my favorite. This was in large part because this novel introduced me to Mary Treat, actual historical figure, correspondent of Charles Darwin, and scientist in her own right. Kingsolver’s portrayal of her is eccentric but intensely likable. Mary was a huge highlight of the novel for me, and I’m dying to read more about her life and work now that I’m done. Kingsolver’s treatment of social issues may come across somewhat heavy-handed, particularly because it relies heavily on dialog and outright debates between character. (Not simply arguments, by the way; at one point in the earlier timeline, there is an actual formal debate on the subject of creationism vs. evolution.) If you enjoy debates as much as I do, this won’t be a detriment at all, but judging by some of the negative reviews, I may be a minority opinion in that regard. 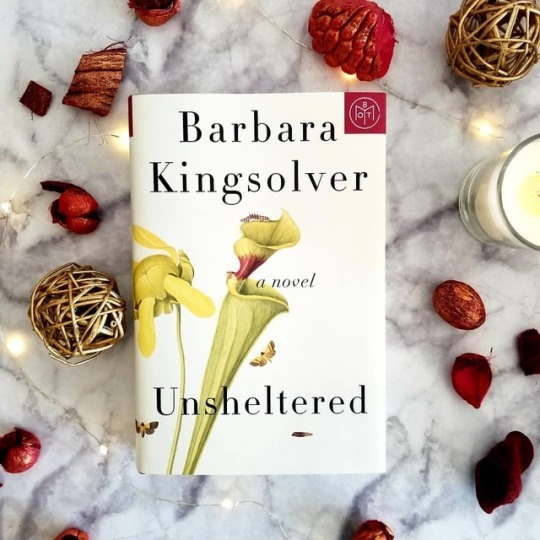 Unsheltered is structurally interesting, with the closing of each chapter leading into the themes of the following one as Kingsolver swaps timelines. Despite the difference between the two stories in the specifics, there were a lot of thematic similarities which I thought were handled really well. Both sets of characters are living in times of social upheaval in very different ways. In the modern timeline, Willa’s family struggles with issues that will feel familiar to most readers: cost of medical care, political polarization, and the seemingly vanishing middle class. Thatcher Greenwood struggles to be taken seriously in a small and somewhat backwards town as an early supporter of Darwin’s theory of evolution. In both timelines, the decaying house looms large as a source of anxiety. Unsheltered may not be for every reader. It’s somewhat long and meandering, and seems to be trying to do a lot by thoroughly exploring both the person and political in not one but two separate timelines. However, I found myself intensely invested in many of the characters as well as the broader social issues Kingsolver has woven into the narrative. Fans of Kingsolver’s past work should definitely give this book a chance. Thank you for reading! Have you read any historical fiction where real historical figures played a major role lately? Share in the comments! If you’ve never read any of Kingsolver’s work, I do highly recommend The Poisonwood Bible. That one was much better received than Unsheltered. Great review! I have a finicky relationship with Barbara Kingsolver but I might have to pick this one up.